Udhilipa, the 'flying siddha', was a wealthy Indian who one day gazed out of his window and saw strangely coloured cloud formations that were assuming the forms of animals. Mesmerized by this illusory display he developed a desire to fly like a cloud across the sky. Then one day the Mahasiddha Karnaripa came begging at his door, and from this great master he learned of a practice that could enable him to fly. This involved him travelling to the twenty-four sacred sites of ancient India, and from each of these sites he collected the twenty-four elixirs of the great female dakinis who dwelled at these places. He was then instructed to alchemically synthesize these elixirs in vessels of copper, silver and gold. After twelve years he succeeded in distilling the elixir of flight, and having simultaneously attained the realization of Mahamudra he ascended bodily into the dakini's paradise realm of light. 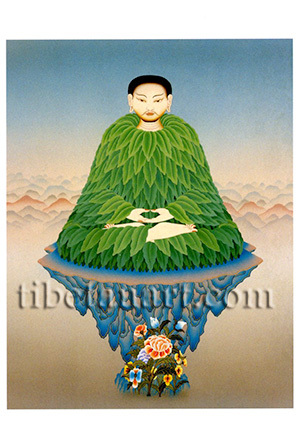 Udhilipa is depicted here seated in meditation posture upon a triangular rock formation, and wearing a garment of leaves.